There was a day, not all that long ago, when Toyota’s Tacoma, along with the likes of Ford’s Ranger and Chevy’s S-10, was a small, personal-sized pickup. These were young guy “first cars” because they were inexpensive wheels, macho enough to get the young girls to pay some attention, plus useful enough to help other young friends move into their first apartments, houses, whatever. 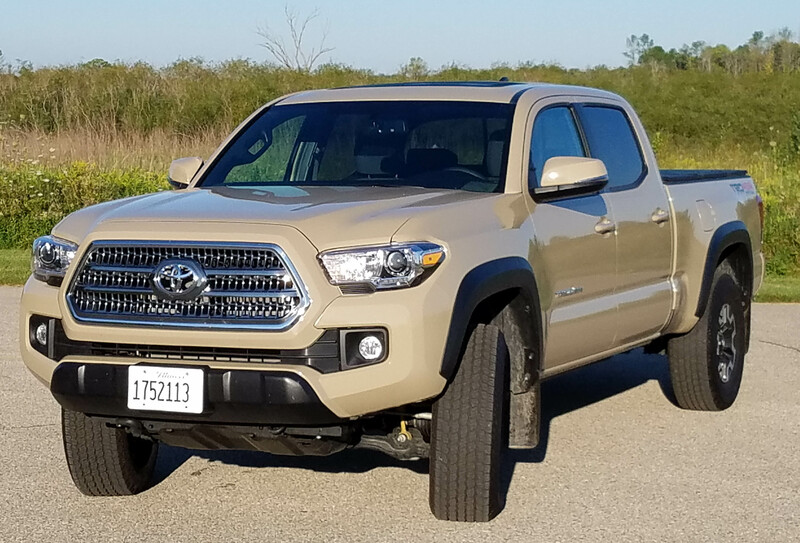 Today the Tacoma, along with other compact pickups, have grown up into bigger mid-sized models that some could almost mistake for full-size trucks. Certainly when you add a double cab (a full back seat and second set of doors), and a long bed (6 feet in the Tacoma’s case), and 4-wheel-drive, you’ve got a vehicle that’s big, long and tall. Then make it a TRD version, which stands for Toyota Racing Development, and you’ve pretty much “machoed” the thing out to the max. 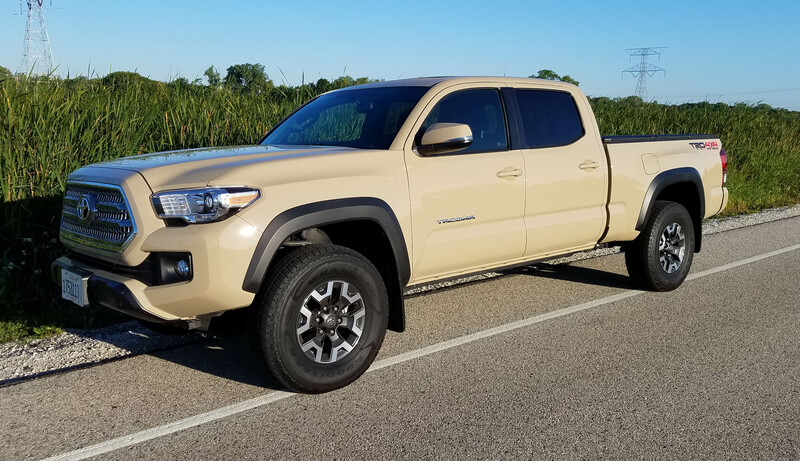 This week’s test truck though went with what Toyota calls a Quicksand color, which is a tan that screams utility service truck. Not a great color for a personal truck. But then the test truck did feature the TRD 4×4 Off-Road decals on the bed’s rear side panels. Tough! How big has the long-bed Tacoma double-cab become? Well, it rides on a 140.6-inch wheelbase and is 225.5 inches long. Weight is 4,425 lbs. Compare that with a comparable Nissan Frontier SL 4WD Crew Cab, which has a 139.9-inch wheelbase, is 219.4 inches long and weighs about 170 lbs. more. 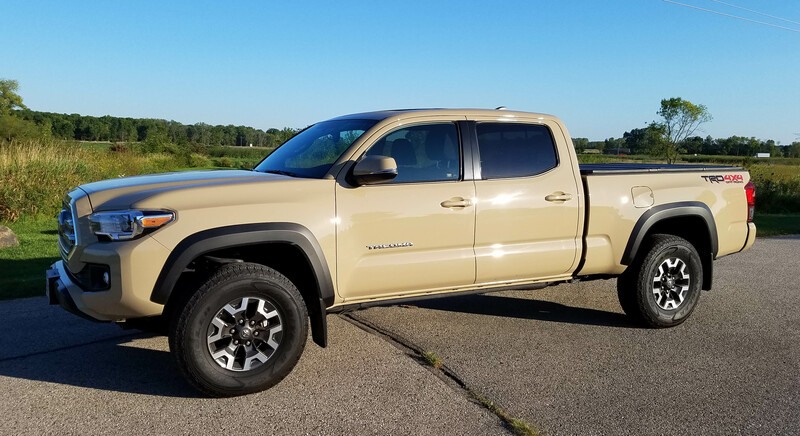 Longer wheelbases usually translate into a smoother, more controlled ride, but Tacoma is a truck and so it provides a stable, yet bouncy, truck ride. You feel bumps and expansion joints, of which there are plenty in southeast Wisconsin. With the off-road shocks and beefed up suspension from the TRD package though, this thing takes big bumps and jolts well. Sailing over rough railroad tracks the truck hardly seems to take note. And there’s plenty of engine. Last model year Toyota upgraded Tacoma with a new 3.5-liter V6 that features the gas-saving Atkinson cycle. Power is rated at 278 horses and 265 lb.-ft. of torque. Tacoma will pull 6,400 lbs. of trailer and boat, snowmobile, or what you will. Still, the truck is heavy and feels it. So the Toyota doesn’t jump away from stoplights. Acceleration through the 6-speed automatic feels methodical and deliberate. You can shift the truck manually if you wish, and that helps perk up the get-away speed, but the engine noise increases along with that, creating more growl. Some will like that, others may find it noisy. Steering effort is heavy too. You need a little muscle to wrangle the Tacoma around city streets. On the highway though it’s an easy truck to control and avoid lane drift. Again, this feels more like a full-size truck than a personal use vehicle for mostly in-town driving. While the new engine is meant to boost fuel economy, I didn’t see that, managing just 16.4 miles per gallon. This Tacoma is rated 18 mpg city and 23 mpg highway by the EPA. Of course it has 4-wheel-drive, which you’d want if you’re taking what starts as a rear-drive truck off road. That’s adjustable too, so you can set the truck to handle whatever sloppy surface you intend to muck around in. So in that way, the Tacoma remains a useful hauler. Plus with its long 6-foot bed you can toss plywood sheets in the back along with lumber for your backyard projects. The tailgate lowers slowly and also is removable and lockable, another plus. 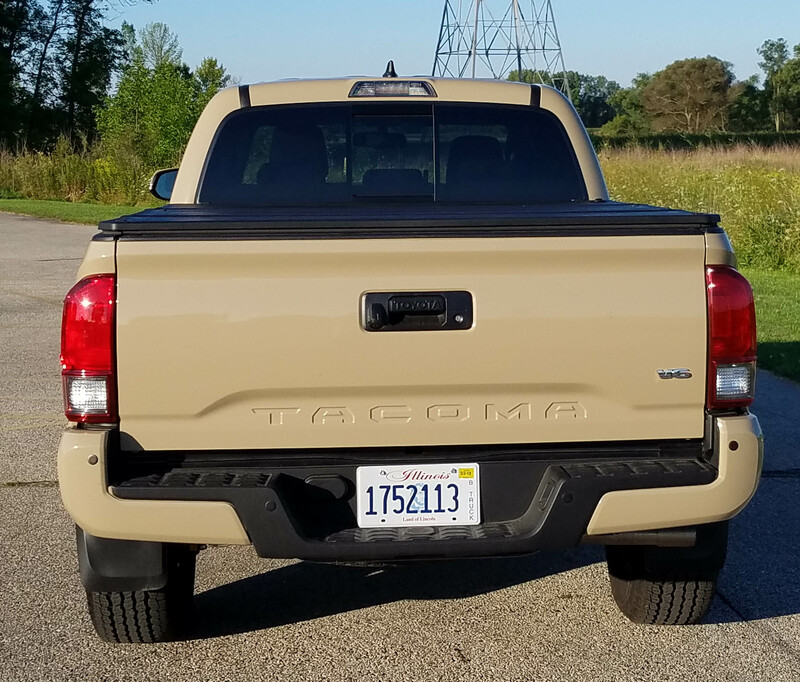 The tan test truck added a hard black three-fold tonneau cover over the bed. This is a $650 option. A bed light mounted atop the cab is standard, helpful for night time loading or unloading. Braking is fine and comes from discs up front and drums in back. However, unlike most trucks today the Tacoma does not offer discs in back, no matter the trim level. Nice 3-piece foldable tonneau cover. Inside, the Tacoma is roomy, as you’d expect with a double cab. The dash is black plastic, while the seats are a gray patterned cloth and door inserts are a textured gray vinyl. The steering wheel is dark gray leather that is thick enough to feel manly, but not so thick that smaller hands couldn’t comfortably grip it. 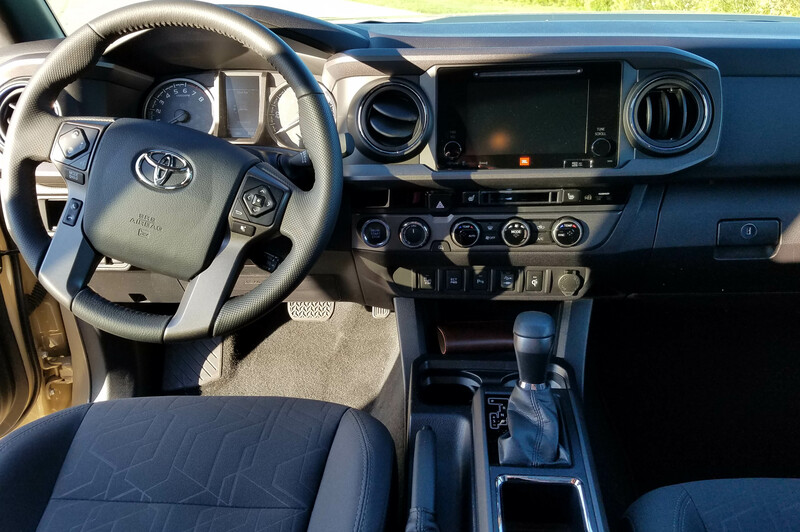 Easily four adults will fit in the Tacoma and the rear bench seat is comfortable enough for city jaunts and kids will be OK in it for longer trips in their car seats or booster seats. Those seats fold flat in back to increase cargo capacity too. 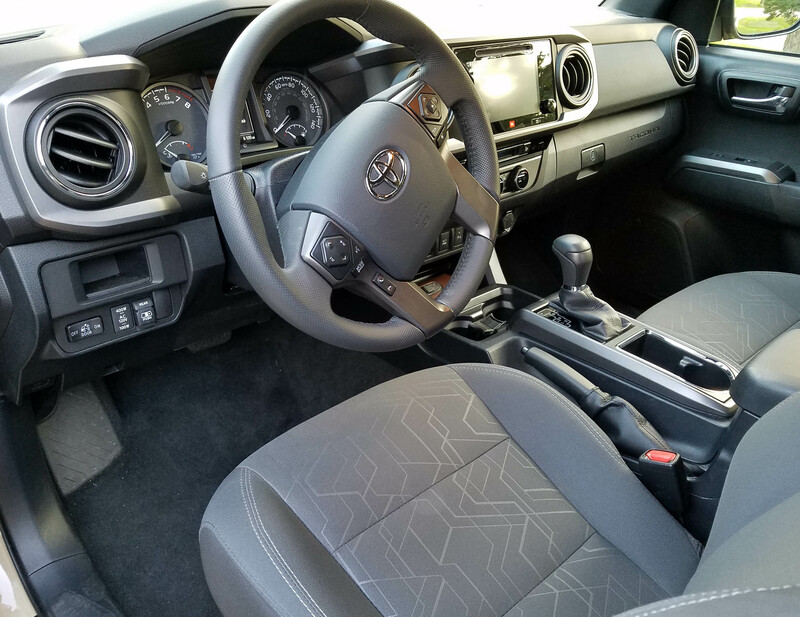 The TRD is no stripped down model, it’s near the top level and includes many of the comfort and safety goodies you’d expect in a car. There’s a sunroof and a power sliding rear window. That can help air flow or you could chance it and extend lumber from the bed through that window on a short haul. Guessing Toyota’s attorneys don’t recommend the later though. This is another comfortable Toyota interior with an easy-to-understand dash and firm yet supportive seats. The seats aren’t powered seats though. In fact, Toyota doesn’t offer power seats in any Tacoma model. Yet the front seats here are heated with three levels to choose from. The dash features four big round air vents, big climate control knobs and a dual climate system. Below the center stack is a wireless recharging station for your phone, plus the radio/nav screen is simple to figure out, an improvement over past models. This one added a $3,035 Premium and Technology package that improved the radio with a better JBL sound system and Entune, the Toyota infotainment system too. Sadly the Tacoma still isn’t compatible with the Android Auto or Apple CarPlay systems. The big option package also adds those heated seats and sunroof, plus a blind-spot monitor, rear cross-traffic alert system, parking sonar, and automatic headlights. Tacoma’s steering wheel is a manual tilt/telescope number and includes the usual radio controls and trip computer buttons on its hub. Cruise control remains on a separate stalk behind the wheel though. I was comfortable in the truck, but being a shorter driver, just 5-5, I found the step up to be quite a stretch. This beast is so tall it needs a running board for easy entry, unless you’re a 6-footer. If you want a mid-size pickup as loaded as this one you may find the pricing a stretch too. The base on this TRD off-roader starts at $35,515, about $2 grand less than its Nissan competitor. But load on the tech package and a few other odds and ends and this one hit $40,617, including a $960 delivery charge. The Tacoma is built in San Antonio, Texas. Naturally you can start at a lower level. The base SR Double Cab with rear-drive lists at $25,910, including delivery. But it uses Toyota’s older 2.7-liter I4 motor and features a 5-speed manual gearbox. Moving up to 4-wheel-drive bumps the SR to $30,695, but you also get the newer V6. 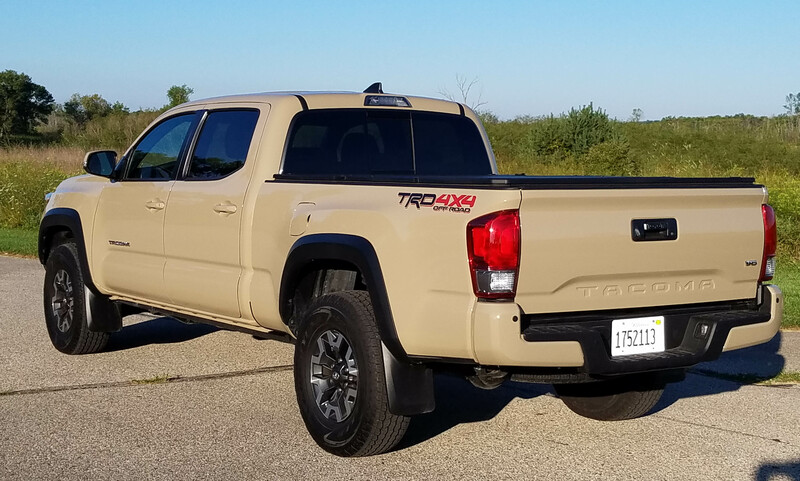 If you want to be a Tacoma top dog, then the TRD Pro model that’s new for 2017 is your beast of burden, starting at $43,720. Gone are the days when there were compact pickups that were easy on the pocketbook and light and nimble to drive. But the new breed of mid-size pickups offer better interior space, comfort, power and utility. Hits: Roomy truck with a long covered bed, sunroof, power sliding rear window and 4WD. Nice interior with heated front seats, blind spot warning system, easy radio/nav screen and adjustments, and supportive seats. Misses: Rides like a truck with a lot of bounce, feels heavy with heavy steering effort and modest acceleration. So tall it needs a running board for easy entry. Tan color made it look like a utility’s service vehicle.